The MortexerTM is MORE than your standard vortex mixer. 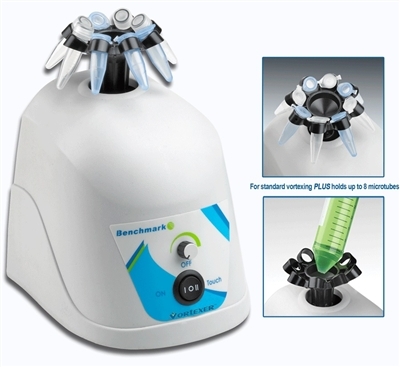 The unique design of the Multi-HeadTM (included) features a traditional cup head for general purpose mixing, plus holds up to eight microcentrifuge tubes. The drive system is balanced with Q-DriveTM technology, providing a smooth vortexing action, while minimizing noise and excessive vibration. This results in quieter, more efficient and longer lasting operation. Increased speed, up to 3400 rpm produces an instant vortex of even the largest sample sizes, including full 50ml tubes. "no-walk" suction feet, cold room/incubator compatibility and spill-proof electronic controls.